Julia is still grieving for her beloved dog Ramon and wants to spend the summer not doing much of anything. Those plans change when her mother makes her audition for The Wizard of Oz along with her little brother and she finds herself cast as one of the Munchkins. Unsure of herself at first, Julia is quickly enamored of her dynamic director and Olive, an adult little person who becomes Julia's friend and mentor. As she begins to speak out more she finds herself attracting attention and becoming more integral to the play. I love Julia's voice although I wondered if she was supposed to be on the autism spectrum or if she was just a nonstop, full of energy kid. I think she's just full of energy. There were about 50 sentences in the book I wanted to write down and hang on my wall because they were just so poignant and craftily written but I also wanted to keep reading so I didn't take the time. The story is slight in that there is not a huge crisis that needs solving and Julia doesn't alienate everyone she knows before she learns an important lesson, but I'm okay with that. 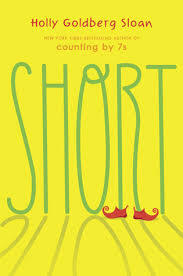 I just enjoyed reading her story and listening to her funny, preteen observations.